The best thing about your father-in-law building a wood-burning oven in his backyard is the amazing pizza you can bake: its pillowy crust dotted with pinpoints of char, the right balance of chewy, soft and crisp. The worst thing about baking in a wood-fired oven? All the other pizzas you’ve ever made seem horrible in comparison. I’m not a newcomer to the world of pizza. Since my first irregularly shaped shaped pie in college (flour those peels!) I’ve come a long way, and have been baking pizza in my home oven semi-regularly for more than seven years. As of this spring Martha and I are observing weekly (Thursday) pizza nights for regular practice and experimenting with new recipes and techniques. After all of this practice I can produce a pretty good pie — at least pies that are rarely figure-8 shaped. But at a mere 550ºF, it takes 8–10 minutes to achieve the level of crust browning I want, but with all that time in the oven the crust dries out too much, leading to a disappointing cracker-like crunch around the edges. I suspected that, rather than blaming my oven, changing the dough recipe might solve these texture issues. For years, I have relied on Peter Reinhart’s Neapolitan dough recipe from American Pie — an excellent recipe to be sure — but lately I’ve tried other recipes on those weekly pizza nights. Recently, I’m working with Jim Lahey’s no-knead dough, as described by J. Kenji Lopez-Alt on Serious Eats. The new recipe was a nice change, but I still found it lacking when baked at home; it seemed under-salted and still too crispy after a ten minute bake. But then I baked it in the wood-fired oven. Oh, what a difference. As soon as the dough hit the oven floor, a tall cornicione popped up around the edges. Within a minute or two black spots dotted this ring. The first pizza was done in under four minutes. The wood-fired pie was a thing of beauty, but the most striking difference became apparent on biting into my first piece: as I mentioned, the texture was a perfect balance of chewy, crispy and silky. But from the flavor I was amazed that I was working with the same dough recipe. What had seemed a bit bland when baked in the home oven was alive with the rich, earthy flavor of wheat, punctuated by the acrid burn of char. The best pizza I’ve ever made, and all I needed to do was dial my technology back 500 years. 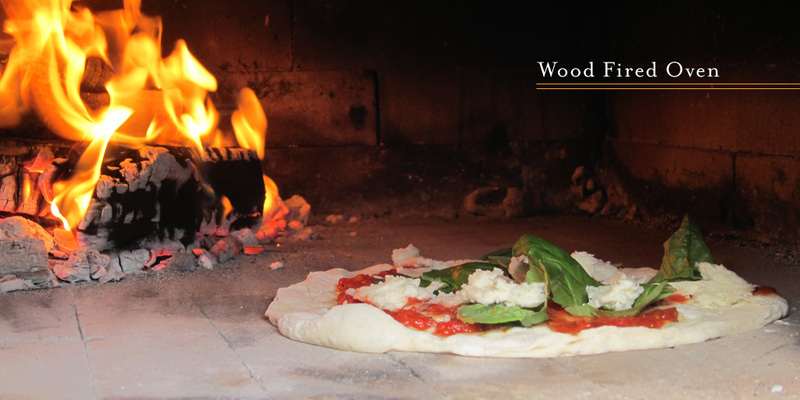 The wood-fired oven is not a total panacea, though. Cooking with a wood fire is more labor intensive than gas or electric. My father-in-law, Juan, starts a fire in the oven about three hours before we want to cook the first pie. Starting the fire this early allows us to heat the floor of the oven to over 750ºF. While Juan takes the role of ovenmaster, I am usually in the kitchen, prepping toppings and caring for the dough. When pizza time comes, I move to an outdoor work station a few yards away from the oven, where I stretch the first pie, quickly top it and then slide it into the center of the oven floor, which Juan has recently cleared of cinders. With a wood fire, you can’t just drop the pizza in the oven, set a timer, and get back to your cocktail — you have to tend to it. Juan usually operates the tools — a long-handled metal peel, a small metal hook to facilitate turning the pies, and the all-important infrared thermometer to monitor the heat of the oven surfaces and the temperature of the surface of the pizza — while I look intently over his shoulder and offer commentary. Because the fire itself has been moved to the sides but not the front of the oven, the crust will brown unevenly unless you turn the pies. I’ve seen the pro pizzaioli manage this trick with the flick of the edge of a peel, but for us amateurs a small metal pole works more reliably. The final step is to raise the whole pie toward the roof of the oven, using the intense heat up there to put a last bit of brown on the cheese and toppings. It’s a lot of work, but pizza like this is worth it. Which gets us back to that problem: home oven pizza that I thought was pretty good just can’t stand up to what I can make in the wood-fire, but it’s not my wood-fired oven — it’s my father-in-law’s. Don’t get me wrong, I really like my in-laws, and would happily spend many evenings baking with them, but they’re a 12 hour drive or $400 flight away. I suppose I could lobby my apartment manager to install a communal wood burning oven in the back of our building, though the fire department might have some concerns. What happened to the days of the municipal oven in the center of town? For the time being, it looks like I’ll have to work on tweaking my indoor oven technique and recipe on Thursday nights, tasting pizza heaven only on our twice-per-year visits back home. It might be a while before my pizzas measure up, but at least I know what I’m shooting for. This entry was posted by Tom on Tuesday, July 31st, 2012 at 7:44 pm and is filed under Food + Drink, Pizza. You can subscribe to responses to this entry via RSS. I’m taking a three-day workshop next week on building a brick oven. Then you can come help me build mine, in exchange for unlimited baking privileges. Shorter term, there’s an oven just down the block from Mala, which they fire from time to time. We would often make pizza on bread baking night from leftover dough, and the best was Carol Fields’s ciabatta (my version). Not Neapolitan; extremely delicious. Now I am very hungry for good pizza, and the best I can do is a cheesy tortilla under the broiler. Damn you…. p.s., I like the new look. The next best thing about a wood fired brick oven is a son-in-law that writes about how great is the pizza baked in your oven. Tom is a great source of new dough formulations that he tries in my oven. I also like to experiment but it is better to have somebody else make the mistakes first. Tom is also very creative with toppings that may include things you never will find in the menu of a pizzeria. He keeps looking at the squirrels that hang out in the oak tree that is above the oven and at the rabbits in the backyard. Do not be surprised if after his next visit to Michigan he comes up with a story on the delights of squirrel pizza with mozzarella cheese made with rabbit milk. I am sure Martha will figure out how to milk the rabbits and Tom will give us his new formulation for Rabbit-Mozzarella. Knowing him, I am sure he will not miss this challenge. Well time to build that clay oven, and put it on a cart that the Brompton can tow. Kenji has a really great article about making WFO-style pizza in a home oven on Slice…it involves using a skillet. Check it out!